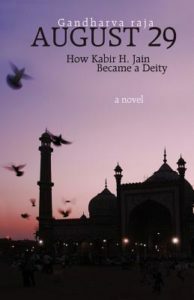 Set in Delhi from the years following Bush’s invasion of Iraq up to the middle of Obama’s first term as president, this novel depicts the philosophical development of Gora, an Indian university student who lives in times of violence between Hindus and Muslims in his own country and is aware of religious strife in the Middle East and Europe as well. In this Bildungsroman, Gora and his three friends Farooq, Yuri, and Milli become followers of a university professor of comparative religion who seems to be training them to join him in a great endeavor. Gora and the others never experience the Dionysian side of life that Hesse’s heroes do—in all their years together Gora and his beloved Milli share no greater intimacy than holding hands—but they do come to an understanding that “religion is the teaching of great men and not divine revelation.” But understanding is not enough, their guru suggests. Although he is a peaceful man (his name is Jain), he eventually calls them to action. Jain has grown up in both the Hindu and Muslim traditions and has studied Buddhist and Christian beliefs as well. Like his disciples Gora and friends, he is disturbed by the violence caused by unthinking adherence to the precepts of religion, and he feels called to do something about it. He suffers a severe concussion and has a spiritual experience in which he is chosen to bring to his world a new revelation. Like Krishna in the Bhagavad-Gita, who is radiantly transfigured for Arjuna, and like Jesus in the Gospel of Matthew, who is radiantly transfigured for Peter, James, and John, Jain has his own kind of transfiguration. Like these figures in the Hindu and Christian faith, he brings a new understanding of the canonized texts, this time of the Koran. Telling the story through the eyes of Gora, grounds its philosophy in the reality of present times. The novel is written in a simple, elegant style. There can be no doubt that its message is important.